A few months ago, Instagram introduced the ability to let you invite a friend onto your livestream. 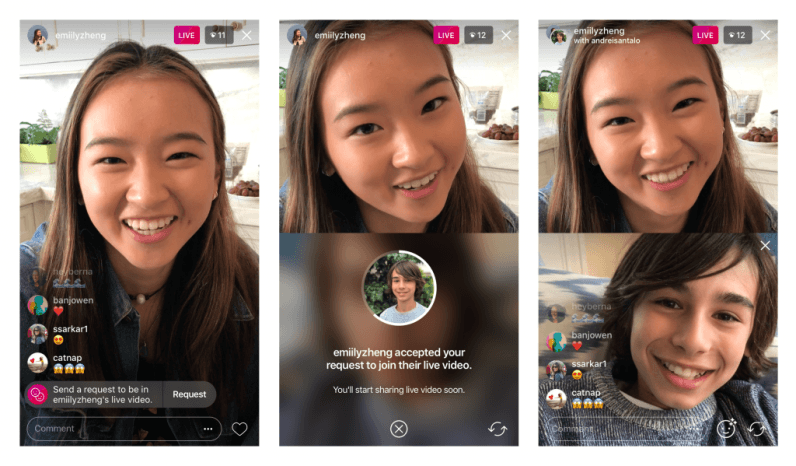 Now Instagram is expanding on the feature: you can now request to join someone else’s livestream. When you’re watching someone else’s stream, you’ll see a new ‘Request’ button in the comments section. Tap on that and wait for your friend to confirm to join in. Although multiple people can make requests, only one extra person can show up on your stream at a time. That said, I wouldn’t be surprised if Instagram increased that number if the feature becomes popular enough. It’s easy to imagine popular Instagram accounts making use of this feature to interact with followers and build a stronger sense of community. I mean, imagine if your favorite musician accepted your request to join a livestream with them. It’s not quite the same as actually getting to meet them, but it’s certainly better than a simple retweet or reply. The update is rolling out to Instagram for Android and iOS today.